At the start of a big picture EventStorming, we ask the participants to write down their domain events on preferable orange stickies without discussion with others. We let them put the stickies up on a paper on the wall in order of time from left to right. It will be utter chaos, you will be ‘critted by a wall of orange stickies’ (hopefully), and the participants now may think; how can we make sense of this mess! With the help of post-it adhesive labellers, we can efficiently structure the chaos by using swim lanes. Now multiple contexts start to emerge by creating communication boundaries. We can structure this by enforcing the timeline, but we are not able to hold this for long because contexts communicate with other contexts in a different point in that timeline, and we might lose sight of the overview again. To gain a better overview, I use the long purple sticky to label policies, which we also use in other EventStorming types. 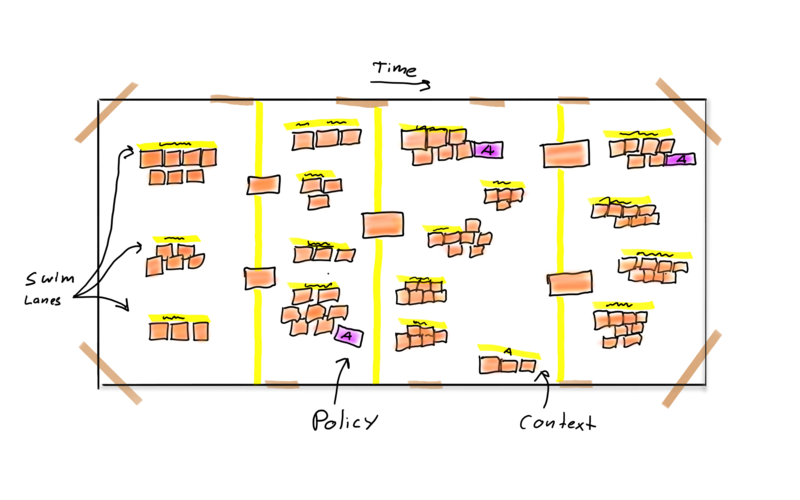 A policy in a Big Picture EventStorming is an agreement of the business and usually goes something like if we do A, then we need to do B. In this case, we can use the purple stickies and place them after a domain event and write down the context that it goes to. This way we can point several outcomes of different contexts for instance to another context, giving us a more precise visualisation of coupling between contexts in Big Picture EventStorming. Also, this post is published on the Xebia blog site.